A Rhino in GTA Vice City. The Rhino is the name of an armored fighting vehicle since Grand Theft Auto III, commonly referred to as the tank. The Rhino has since appeared in Grand Theft Auto: Vice City, Grand Theft Auto: San Andreas, Grand Theft Auto: Liberty City Stories, Grand Theft Auto: Vice City Stories, Grand Theft Auto: Chinatown Wars, and Grand Theft Auto V.
Like its predecessor in Grand Theft Auto 2, the Rhino appears when the player attains a 6-star wanted level. In all games, the Rhino can be avoided without much difficulty because of its slow speed and bad handling, but it's extremely deadly if the player attempts engaging one, and the soldier driving it always carries strong weapons. Also, when successfully stolen, authorities or hostile characters can bust/pull out the player due to the Rhino's slow speed. When it hits a vehicle, the vehicle most of the time explodes straight away; if not, it starts to burn instead. In GTA Chinatown Wars, however, this does not happen. Although the Rhino has a cannon, it is never used by law enforcement, presumably because it would make surviving and escaping 6-star wanted levels impossible. However, this is changed in GTA Chinatown Wars as the army will fire the cannon which causes massive damage to, and usually kills, the player. The Rhino is practically invincible to gunfire and explosions, but can be damaged by crashes, the Police Maverick's machine gun, and most importantly, flames, making the Molotov Cocktail and Flamethrower the best weapons against a Rhino. In GTA III, GTA Vice City, GTA Liberty City Stories, and GTA Vice City Stories, the Rhino appears to be closely based on the German Panzer IV tank, more specifically a cross between the Panzer IV Ausf. H with its distict side armor plates and the Panzer IV Ausf A with its short barrelled gun turret. This is also reinforced by its name "Rhino" as in the German language the indian rhinoceros is called the "panzernashorn" which literally translates to "armored rhino". In GTA Vice City, the "Spawn Rhino" cheat is "panzer" on the PC version. 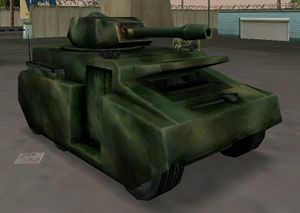 In its original appearance in GTA III, the Rhino assumes a stark appearance with little details on its armored body. The GTA Vice City rendition, however, added various equipment on the vehicle, such as smoke launchers at the front of the vehicle and seat pads at the sides. as well as enlarging the turret's barrel. While the GTA Liberty City Stories and GTA Vice City Stories would follow design ques of the GTA III and GTA Vice City renditions, the turret barrel of GTA Liberty Stories rendition is of the same size and length as that in GTA Vice City. In GTA San Andreas, the Rhino looks like an M1 Abrams and is much more realistic. It is colored beige (desert camouflage), has a normal tank entrance in front and a new drivetrain with smaller wheels, which look almost like tracks. It also has a new steering system, that finally allows the player to make very tight turns. The turret is operated with the mouse or right thumbstick (PlayStation 2), which allows the player to shoot directly at the target. The Rhino in GTA San Andreas is also heavy enough to literally push aircraft, making the Rhino an ideal vehicle to push the destroyed Andromada from "Stowaway". The Rhino does not appear in Grand Theft Auto IV; this is assumed to be because of Rockstar's goal of making GTA IV more realistic than previous games, although remnants of a tank remains. The episodic pack The Ballad of Gay Tony, however, features the tank-like APC vehicle. However, GTA Chinatown Wars reintroduces the Rhino with an appearance similar to the original Rhino but depicts tank treads. The Rhino returns in Grand Theft Auto V where it seems to be based on the German Leopard 2A4. Unlike in previous games, it now features moving tank treads which were likely omitted from previous incarnations due to hardware or game engine limits. It features an unusable M2HB .50 caliber machine gun on the commander's hatch. GTA Vice City Stories (Rear quarter view). GTA V (Rear quarter view). Handling of this tank is terrible. Even at low speeds, its turns are horribly wide. Unlike the normal tank, it has very poor acceleration, when maximum speed is normal for this kind of tank. It has a working handbrake, but because of its wide turning radius and dual rear axles, it is difficult to tighten turns with it. The tank is quite bouncy, so its wheels easily lose contact with ground. Its small ground clearance, bouncy suspension, and low torque makes this tank very poor when driving off-road, or even through small barriers. This tank has 2 steering modes: normal, which allows it to make turns a little better than trucks; and extra, activated with handbrake button, allows to make extra tight turns. It has little better off-road abilities, but it is still far from perfect. It has better acceleration and grip, but it still cannot go through high obstacles. It handles better on road. The turret now points to where the player's camera is pointed, making it difficult to aim in some circumstances. It has no lights or sirens. The player is able to reach high speeds by rotating the turret towards the rear of the tank and start shooting. The recoil from the cannon will propel the Tank forwards, and vice versa. If the Tank hits a normal vehicle with a light amount of force, the vehicle will explode. Because of its slow speed and presence of doors, the player can be easily busted by a police officer or any other lawman, or pulled out by any hostile pedestrian. It is even more hazardous when the doors are missing. The tank is completely impervious to explosives and bullets, but is neither flameproof nor immune to damage from collisions. The player can still use the turret trick to accelerate, however, because of the camera in San Andreas, the player cannot see anything in front of them while the cannon is aimed rearward. To get around this problem, switch to First-Person view or Cinematic view camera once the cannon is aimed rearward. Damage caused to other vehicles is determined by the amount of force actually used: slight touches only push other vehicles, harder hits causes a vehicle to smoke or catch fire, and the hardest hit instantly destroys a vehicle. Because of the more realistic access hatch in GTA San Andreas, it is more difficult for the player to get pulled out. Like with other renditions, this rendition of the Rhino is not immune to damage from collisions. Strangely, even the Police Maverick's machine gun can damage the Rhino, which would have been impossible with any normal firearm. From GTA III to GTA Vice City Stories, the Rhino is bullet-proof and explosion-proof and as such it is immune to all weapons minus incendiary weapons like the flamethrower and molotovs. In GTA San Andreas, the Police Maverick's machine gun can actually deal damage to the Rhino, which would have been impossible with any normal firearm. The Rhino is still a durable vehicle; however, after sustained collisions from other vehicles, tanks, and static obstacles, its engine will eventually catch on fire and explode. While driving the Rhino, one should be careful not to drive through the flames left behind by vehicles that have exploded, as these will set the Rhino on fire, which causes very fast damage and usually destroys it after the second time the Rhino catches fire from flames. Due to the introduction of thread for GTA Chinatown War's Rhino, the tank gains another a minor advantage in that it can turn while in a stationary position. The durability of the game's Rhino, however, is turned down a notch, being more vulnerable to explosive damage than previous renditions; a pristine Rhino will begin burning as a whole after receiving seven direct hits from a Rocket Launcher or another Rhino's turret. However, it is still bulletproof. In the tank, the player can perform Vigilante missions, which means catching and killing suspects. The Rhino isn't necessarily the best vehicle to do this mission because the player risks increasing their own wanted level at an accelerated rate due to the tank's penchant for collateral damage. On the other hand, if the player cannot complete the missions with the other, comparatively flimsy police vehicles, the Rhino might be better. If the player can intercept the enemy vehicles, rather than chasing them, the player may be able to strike the targets with the tank instead of firing on them. This method cuts down on the wanted level the player receives, which may help him avoid having to fight the military on some occasions. In GTA III, the player cannot get a wanted level for destroying vehicles in the Rhino by simply hitting them instead of using the cannon. Interestingly, in GTA Vice City, performing the same crime causes the police radio to call out the player as performing vehicular theft, much like when the player sets vehicles on fire with a flamethrower or molotov cocktail. In GTA Vice City, there is a mission in which the player has to steal a tank under orders from Juan Cortez: Sir, Yes Sir!. Its doors are closed, so the player needs to wait until the driver hops out to buy some doughnuts, or kill the soldier on top of the tank. This tank has a self-destruct mechanism which the player must disable before it destroys the tank. The mission is failed if the tank is successfully stored in the Viceport Military Garage or if it is destroyed. In GTA Liberty City Stories, during the mission "Shogun Showdown", the Yakuza are storing weapons in a warehouse (they are actually located and along with that Toni Cipriani finds a Rhino which he later destroys by detonating it with a bomb or driving it into the water. In GTA Chinatown Wars, during the mission Deadly Xin, Xin Shan has the player use a NOOSE Rhino parked at Francis International Airport to create havoc, diverting the police from his own machinations. Available at Phil Cassidy's Army Surplus in Rockford, only unlocked after "The Exchange". The Rhino is also parked here during the mission "Arms Shortage". However, it is locked. To obtain, push it to your safehouse garage after killing the Colombian Cartel members or after finishing the mission. In the Fort Baxter Air Base after having collected 90 Hidden Packages. Available inside Area 69. Note that when this area is entered, a 5-star wanted level is attained. Will spawn underneath the bridge going above Ganton after 100% completion is achieved. Spawns at Fort Staunton when 100% completion is achieved. Inside the Fort Baxter Air Base, much like in GTA Vice City. Unlike GTA Vice City, though, it is there from the beginning of the game but unlocked only when the mission Last Stand is done. Available for purchase from the Auto Merchant when the main story is complete. Can be found in a fenced-off warehouse area at the southern end of Francis International Airport; activates Fast Tracks. Players will warp outside a parked Rhino at the starting point regardless of whether or not the player completes or fails the mission (NOTE: To be used normally, the Rhino must be entered before the player quits the side mission and reenter the Rhino quickly). Found inside Fort Zancudo patrolling the base perimeter. If the player owns an aircraft hangar, it can be purchased from Warstock-cache-and-carry.com for $3,000,000. The Rhino in GTA III can be spawned by inputting cheats. The Rhino in GTA Vice City can be spawned by inputting cheats. The Rhino in GTA San Andreas can be spawned by inputting cheats. On the Android versions of GTA III and Vice City, the cheats may actually spawn random vehicles instead. It is still possible to spawn a Rhino, but the cheat has to be entered multiple times as the game cycles through the spawned vehicles based on their internal ID numbers. Also, there is the risk of a game crash. Sometimes a glitch occurs in GTA San Andreas, where the player is flying and has six stars, an NPC-controlled Rhino may randomly jump up in the sky and spin around very fast. Low-detailed LOD models of the Rhino in GTA San Andreas appear to assume a design more similar to older Rhinos. This difference is apparent when the player views one of the tanks from afar. It is possible that certain elements of the Rhino, including its performance and ability to easily destroy other vehicles, may have been inspired by a real-life 1995 police chase in San Diego, California, involving a similar-looking tank (an M60 Patton) seen here. In the PlayStation 2 version of GTA San Andreas, if using the faster gameplay cheat, the Rhino can sent spinning into the air by pressing the circle button while the Rhino is on its top. If the player spawns a Rhino on the edge of a bridge it may, on occasion, jump into the sky and disappear randomly. In all GTA III Era games featuring the Rhino with doors, despite the apparent height of the seats, the player will actually pull out the driver/passenger in the same manner as for sports/super cars. Tank, GTA1, GTA2 and GTA Advance equivalents. Royal Pain, GTA London 1969 equivalent. Tiger Tank, GTA London 1961 equivalent. This page was last modified on 23 June 2015, at 17:56.